Pure-Play Uranium - Near-Term Production at Powder River Basin, Wyoming U.S.A.
Uranerz Energy Corp. controls 124,200 acres in the central Powder River Basin of Wyoming, U.S.A., an area well-known for hosting uranium-mineralized roll fronts often amenable to ISR mining techniques. Uranerz Energy Corporation had a very successful 2009, during which several key milestones were achieved, positioning the Company to become one of North America's next in-situ recovery ("ISR") uranium producers. Signed long-term uranium sales contracts with two of the largest nuclear utilities in the U.S.
"Uranerz" literally means "uranium ore", in German. Uranerz is pronounced "your honors", like addressing judges in a court of law. Uranerz Energy Corporation is a pure-play uranium company listed on the NYSE Amex Exchange and the Toronto Stock Exchange under the symbol "URZ", and is also listed on the Frankfurt Stock Exchange under the symbol "U9E". Click the quote links in the tables above to get up-to-date stock prices and other information about the company and its common shares or warrants. The Uranerz management team has specialized expertise in the ISR uranium mining method, and has a record of licensing, constructing, and operating commercial ISR uranium projects. Two of Uranerz's projects in the Pumpkin Buttes Uranium Mining District of the Central Powder River Basin of Wyoming, U.S.A., are in the final permitting and licensing stage. The Company has already entered into long-term uranium sales contracts with two of the largest nuclear utilities in the U.S., including Exelon (operates the largest nuclear fleet in the U.S. and third largest in the world). Uranerz has submitted federal and state mining applications to build and operate the Nichols Ranch ISR Uranium Project which, when constructed, is planned to consist of a central processing facility at the Nichols Ranch property and a satellite facility at the Hank property. In late November 2010 the company received a draft NRC Materials License, and on December 29, 2010 Uranerz announced completion of an "at-the-market" financing that raised US$20 million in gross proceeds. The company now has approximately US$36 million in its treasury and no debt. On January 4, 2011 Uranerz announced state approval of one the first new commercial uranium permits issued by the Wyoming Department of Environmental Quality WDEQ in almost 20 years. Then on January 24, 2011 the company announced that the United States Nuclear Regulatory Commission NRC has completed the final Supplemental Environmental Impact Statement SEIS - see above Uranerz Energy Recent Headlines - news releases and announcements for these full news releases. Uranerz Energy now has the final permitting SEIS and Materials License green-light to commence construction of the Nichols Ranch ISR uranium mine. Production at Nichols Ranch is currently forecast to commence in the first half of 2012. The following Claim Legend shows: Uranerz Energy Corporation's, Cameco Resources' and Uranium One's land positions in the Central Powder River Basin, Wyoming, USA, as of October 2010. Also see Uranerz Energy's project units that are currently being permitted. Uranerz is focused on achieving near-term commercial in-situ recovery ("ISR") uranium production in Wyoming, the largest producer of uranium of any U.S. State. Uranerz owns or controls approximately 124,200 acres (50,255 hectares or 194 square miles) in the Pumpkin Buttes Uranium Mining District of the Central Powder River Basin of Wyoming, U.S.A., an area well-known for hosting uranium-mineralized roll fronts often amenable to ISR mining techniques. Uranerz has over 30 wholly-owned and joint-ventured projects in the Powder River Basin of Wyoming. The Powder River Basin of Wyoming has some of the highest grade uranium deposits in the State that are amenable to the cost-effective in-situ recovery mining methods. Commercial ISR mining in the Powder River Basin has been ongoing since 1987, with production coming from Cameco's Smith Ranch-Highland mines and previously from Uranium One's Irigaray/Christensen Ranch ISR mine which is currently projected to re-start operations in 2011. The Company also has an 81% interest in the NAMMCO properties, which cover approximately 66,972 acres (27,102 hectares) in the central Powder River Basin (collectively, the "Arkose Property"). In connection with this acquisition, the Company and United Nuclear, LLC, a limited liability company owned by the sellers of the NAMMCO properties, have formed and contributed their interests in the NAMMCO properties to the "Arkose Mining Venture". United Nuclear will hold (and contribute to) a 19% working interest in the Arkose Mining Venture. The Arkose Property is located in close proximity to the Company's 100%-owned properties in the Powder River Basin, including adjacent Collins Draw and Doughstick and other nearby properties that have been the subject of the Company's recent exploration and mine licensing efforts. As operator of the Arkose Mining Venture, the Company continues to conduct aggressive exploration drilling programs to identify new uranium mineralized trends and to further delineate known resources. These exploration results can be used to generate data for future permit applications and eventual ISR mining operations. In Wyoming there are two major permits/licenses required for the commencement of In-Situ Recovery (ISR) uranium mining: 1) the federal Nuclear Regulatory Commission (NRC) Source Material License and 2) the Wyoming Department of Environmental Quality (WDEQ) Permit to Mine. These two items allow for the construction of an ISR uranium operation and ultimately the commencement of uranium production. Read Uranerz Energy's news releases dated November 23, 2010 Uranerz Receives Draft NRC Materials License for Nichols Ranch ISR Project, January 4, 2011 Uranerz Receives WDEQ Permit to Mine for Nichols Ranch Uranium Project and January 24, 2011Uranerz Energy Corporation: NRC Determines No Major Environmental Impacts Preclude Licensing of Nichols Ranch ISR Uranium Project. These are all major achievements that now allow the company to build its first ISR uranium mine. Just as important, they demonstrate management's ability to successfully navigate the complicated uranium mining permitting process in an efficient and timely manner. Uranerz also plans to drill its other uranium projects in the Central Powder River Basin of Wyoming. These future drill results will determine which properties are selected next for permitting applications and mine development. Click the chart above for more information on the ISR Uranium Mine Permitting Process in Wyoming. Uranerz Energy Corporation has reported NI 43-101 uranium resources for seven of its over 30 uranium projects in the Powder River Basin area of Wyoming, U.S.A. The table below shows the Company's total estimated uranium resources as of October 14, 2010, on those seven projects. From Uranerz Energy's January 4, 2011 new release, "... The Nichols Ranch project contains an estimated 5.5 million pounds of uranium resources and will serve as a platform to develop the Company's other Powder River Basin projects through the permit amendment provisions of the regulatory process. ..."
The central processing facility at the Company's Nichols Ranch ISR Uranium Project is being licensed for a capacity of 2 million pounds per year of uranium (as U3O8). It is planned that this facility will process uranium-bearing well field solutions from Nichols Ranch, as well as uranium-loaded resin transported from the Hank satellite facility, plus uranium-loaded resin from any additional satellite deposits that may be developed on the Company's other Powder River Basin properties. This centralized design enhances the economics of the Company's potential additional satellite projects by maximizing production capacity while minimizing further capital expenditures on processing facilities. With the required regulatory approvals having already been achieved in January 2011, commencement of operations at the Nichols Ranch ISR Uranium Project is currently forecasted for the first half of 2012. The number of pure-play uranium stocks is relatively small, with just a few major players controlling the majority of uranium production worldwide. Even within the table above, the largest companies by market capitalization (Rio Tinto and BHP Billiton) are better known for their mining of base metals, precious metals, gem-stones or other commodities, than solely for their uranium production. Uranium producers seem like an exclusive club, that the biggest members may want to keep that way. A Special to Globe and Mail Updatepublished January 27, 2010, entitled "THE BIG PICTURE - Owning uranium producers could be a long-term energy strategy", reported that "Junior companies that have found, or are developing, large deposits of uranium are acquisition targets for larger producers or users in countries eager to secure supplies..."
Uranerz Energy has advanced uranium projects, management experience and millions in the treasury. URZ's market-cap is around $300 million - Uranerz is not yet a uranium producer. Uranium producers in the table above start at a market-cap of $3.5 billion, to as high as $243.7 billion. In July 2005 management changed its corporate name to "Uranerz Energy Corporation". Uranerz is an identity that most of the current management had worked with before, as former officers, senior management and employees of the original Uranerz Exploration and Mining Limited and related companies (the "Uranerz Group"). The Uranerz Group was the world's third largest uranium producer when it was acquired in 1998 by Cameco, the world's largest primary uranium producer. This management team has the experience, the contacts, the ability, the competency and the desire to build Uranerz Energy into a significant producer of uranium. The Company also has an advisory board that consists entirely of ex- Uranerz Group professionals. Mr. Higgs has been involved in the financial and venture capital markets for over twenty-five years, raising millions of dollars in the United States, Canada and Europe. He founded his first junior exploration company in 1983 and took it public through an initial public offering in 1984. Since then, Mr. Higgs has been involved in the founding, financing, initial public listing, and building of several companies. Mr. Higgs was directly involved with the founding and initial public offering of Arizona Star Resource Corp. and the listing and financing of BioSource International Inc. In July 1990, Mr. Higgs established Senate Capital Group Inc., a private venture capital and management consulting company. With this company, his focus is on the creation and funding of seed and early-stage companies with sound projects and good management. More specifically, Mr. Higgs helps formulate the business strategy and, if necessary, assemble the team to successfully maneuver these companies through the critical early stages of raising sufficient funding to meet their needs. At the same time, he emphasizes and facilitates the companies' listings on a stock exchange to provide additional funding sources to those companies. At present, Mr. Higgs also serves as a director of Miranda Gold Corp., a Canadian public gold exploration company, which he founded in May 1993 (TSX-V: "MAD"). In 1988 Mr. Catchpole joined Uranerz U.S.A., Inc. and Uranerz Exploration and Mining and became Director of Regulatory Affairs, Environmental Engineering and Solution Mining. Mr. Catchpole's responsibilities included the monitoring and oversight of the environmental and regulatory aspects of two large uranium mines in Canada and the operational aspects of one uranium solution mine in the United States. In 1996 Mr. Catchpole was appointed General Manager and Managing Director of the Inkai uranium solution mining project located in the Republic of Kazakhstan (Central Asia). In 1998 Cameco Corporation acquired Uranerz U.S.A. Inc., and Mr. Catchpole continued his post at the Inkai Project for Cameco. Mr. Catchpole spent six years taking the Inkai project from acquisition through feasibility study, joint venture formulation, government licensing, environmental permitting, design, construction and the first phase start-up. Following his departure from Cameco in 2002, Mr. Catchpole was an independent consulting engineer providing project management to the oil and gas, mining, and construction industries. Mr. Catchpole is experienced in all phases of project development including environmental permitting, procurement, scheduling, budgeting, and construction of infrastructure and main facilities. He has served on numerous mineral evaluation and due diligence teams. Mr. Hartman has thirty-seven years experience developing metals and industrial mineral projects from the greenfields stage to production. He has an M. S. degree in Mineral Economics (Colorado School of Mines) and a B. S. in Chemical Engineering (University of Denver). Four process patents have been granted in his name. His experience includes thirteen years managing several in-situ leach uranium mines from green field exploration sites through commercial production. For the past fourteen years Mr. Hartman was General Manager for Fort Cady Minerals Corporation where he had complete responsibility for solution mining and process development, permitting, design, procurement, construction, production and property management. Property management included federal mining claims and private leases for a large deposit of borate mineral. He managed the project from test stage through construction and operation of a demonstration production facility. He was also involved with product marketing. From 1982 to 1989 Mr. Hartman was General Manager, In-Situ Leach Projects, for Uranerz USA. During this period he managed the interests of all in-situ uranium projects which Uranerz USA owned including Ruth, Crow Butte, and North Butte. Under his management, Uranerz served as the contract operator for the successful test solution mining of the Christenson Ranch uranium property now owned by Uranium One. He was on the Uranerz acquisition team that studied potential uranium and precious and base metal properties in Nebraska, Colorado, Texas, New Mexico, Utah, California and Wyoming. Prior to joining Uranerz, Mr. Hartman was president of Ogle Petroleum Inc. where he was in overall operating charge of this uranium production company that joint ventured with Duke Power on a commercial solution mine in Wyoming. He was responsible for managing the project from green field exploration through commercial production (shipped filtered yellowcake to the converter). Mr. Hartman personally designed the processing plant facilities. Previous to his work with Uranerz, Mr. Hartman was the Texas Mines Manager for Wyoming Mineral Corporation (Westinghouse), where he was responsible for the management of two production in-situ uranium mines with ion exchange processing plants in Bruni, and Three Rivers, Texas (shipped dried yellow cake to the converter). Mr. Ben Leboe was a senior consultant, management consulting of the Business Development Bank of Canada, from January 2005 to February 2006. Previously, Mr. Leboe was president, secretary, treasurer, principal financial and accounting officer and a director of Asia Payment Systems Inc., a United States and Hong Kong based company engaged in payment processing services and related applications from June 1998 to January 2005. Concurrently, from January 2003 to January 2005, Mr. Leboe was the chief financial officer of C-Chip Technologies Inc. (now Manaris Corporation), a Montreal based corporation developing high-tech products and services for security and risk mitigation activities. Mr. Leboe has been the principal of Independent Management Consultants of British Columbia from 1990 to date. Concurrently, Mr. Leboe was previously vice-president and chief financial officer of VECW Industries Ltd. from 1990 to 1993, and a partner of KPMG Consulting from 1978 to 1990. Mr. Leboe received his bachelor of commerce degree from the University of British Columbia. Mr. Leboe is a chartered accountant and a certified management consultant in the Province of British Columbia. Mr. Leboe has been appointed Ethics Officer of Uranerz Energy. Mr. Brown, a 35 year veteran in the mineral extraction industry, started his uranium geology career with the OPI-Western Joint Venture in Wyoming in 1977. He managed the exploration program in the Great Divide Basin for the Joint Venture delineating over 20 million pounds of uranium resources. Mr. Brown later became the well field engineer for the OPI-Western Joint Venture at the Bison Basin commercial In-Situ Recovery ("ISR") uranium mine. He designed and supervised the construction of some 450 monitor and mining wells for the 600 gpm (gallon per minute) mining operation. Mr. Brown managed the daily operation of the well fields, and developed innovative methods for regulating flow balance, conducting well field maintenance, and performing well work-over. He also served as the designated mine site radiation safety officer. In the mid-1980s Mr. Brown joined Malapai Resources Company (subsidiary of Arizona Public Service) working at the Willow Creek Research and Development ISR uranium test site located in the Powder River Basin of Wyoming. After the successful test mine, he was transferred to Malapai's Irigaray Mine where he assisted with the start-up of the Christensen Ranch ISR commercial uranium mine performing environmental permitting and compliance duties. While with Malapai, Mr. Brown was also involved with aquifer restoration activities at the Irigaray ISR mine. Mr. Brown joined Uranerz USA, Inc. (former Uranerz Group) in 1989 to conduct detailed feasibility studies for the proposed North Butte ISR mine. His work included well field geology, reserves estimation, design and selection of surface and down hole equipment, and cost analysis for the 2000 gpm operation. He also conducted claims assessment drilling and assisted in the procurement of required state and federal mining permits. Prior to joining Uranerz Energy Corporation full-time in 2007, Mr. Brown was a Company consultant, providing geology services including the acquistion evaluations of Great Divide and Powder River Basin projects. Mr. Brown received his Bachelor's degree in Geology from the University of Wyoming. He is a Registered Professional Geologist in Wyoming and a Certified Safety Professional. In addition to his uranium background, he has extensive experience in coal and industrial minerals mining as well as oil and gas extraction. Mr. Hirschman is a graduate of the University of Wyoming and has over 30 years of experience in the mineral exploration industry serving in various capacities and most recently as Manager of Lands, International with Newmont Mining Corporation. Mr. Hirschman has supervised mineral property acquisitions, prepared and negotiated agreements including joint ventures, performed land status investigations on federal, state and private mineral interests in the Western USA, and maintained land records insuring timely satisfaction of land payments and agreement obligations. Ms. Sandra MacKay obtained her Bachelor of Laws in 1983 from the University of British Columbia. She practiced as a commercial and securities lawyer with a major Vancouver law firm before joining Chevron Canada Limited as in-house counsel. Ms. MacKay has over 20 years of experience working as counsel within business organizations in a variety of industries including petrochemical, engineering, and biotechnology. She has most recently acted as corporate counsel to QLT Inc., a Vancouver based dual listed (Nasdaq/TSX) international biotech firm and as Vice President and General Counsel to Aker Solutions Canada Inc., a Vancouver based international supplier of engineering technology which is part of the Aker group of Companies based in Oslo, Norway. Ms. MacKay has acted for both public and private companies on a wide variety of corporate-commercial transactions including acquisitions, licensing deals, and joint ventures and has provided general counsel to her clients on various subject matters including securities law compliance, employment law, corporate governance and general corporate-commercial matters. Ms. MacKay joined Uranerz in July of 2009 as Legal Counsel and Corporate Secretary and was appointed Vice President, Legal and Corporate Secretary in July of 2010. Previous to his work with Uranerz, Dr. Kirchner spent six years developing and managing the Kamoto Mine in Kolwezi, Zaire; four years consulting on mining and civil engineering projects in several countries including Surinam, Nigeria and Congo; five years as a mine superintendent and exploration manager in Greenland where he discovered the Molybdenum Porphyry Erzberg. Dr. Kirchner also spent three years as a project engineer on dams in Austria and Japan, and road projects in Saudi Arabia. Mr. Saxton is a mining engineer who also holds an MBA from the University of Western Ontario. He has been active in the mining industry since 1969, holding various positions including mining engineer, mine superintendent, president and chief executive officer of numerous Canadian mining companies. Following 10 years with Cominco, Mr. Saxton became vice-president and president of Mascot Gold Mines Ltd., initially working on the design and construction of the Nickel Plate mine in British Columbia, Canada. Subsequently Mr. Saxton became a vice-president of Corona Corporation where he was responsible for western operations and exploration for the company and was instrumental in the re-opening of the Nickel Plate Mine. In 1989, Mr. Saxton was appointed senior vice-president of Viceroy Resource Corporation where he was responsible for helping to obtain financing and the construction and operations of the Castle Mountain mine in California. In 1994, Mr. Saxton was appointed president of Loki Gold Corporation and Baja Gold Inc. where he was responsible for arranging over $45 million in mine financing and bringing the Brewery Creek Gold mine into production. Following his departure from Viceroy in 1998, Mr. Saxton became president of Standard Mining Corp., organizing the company and supervising its exploration activities until 2001, when Standard Mining Corp. was merged with Doublestar Resources Ltd. In March 2004, Mr. Saxton was appointed as a director and president of Lincoln Gold Corporation, a company engaged in mineral exploration in Mexico and in the State of Nevada. Mr. Saxton is a member of the Nomination and Governance and Compensation committees. Mr. Arnold J. Dyck was employed at Uranerz Exploration and Mining Limited from 1977 to 1998. Mr. Dyck progressed through various positions with Uranerz Canada Limited, Uranerz Exploration and Mining Limited, and Uranerz U.S.A. Inc. to become the Senior Vice-President and Chief Financial Officer for the Uranerz group of companies. He also served as a member of the board of directors for Uranerz U.S.A. Inc. and as chairman of the board with a subsidiary mining company. Uranerz Exploration and Mining Limited, Uranerz Canada Limited, Uranerz U.S.A. and the original Uranerz group of companies are not connected with, or a predecessor company to Uranerz Energy Corporation. The original Uranerz group of companies was acquired by Cameco, the world's largest primary uranium producer, in 1998. Mr. Dyck is a graduate of the Registered Industrial Accountant education program and was awarded the designation of Certified Management Accountant in 1975. Mr. Dyck has been appointed to the Company's audit committee and compensation committee. Mr. Peter W. Bell practiced as a licensed pharmacist until 1968. Since that time he has been a self-employed consultant and a director and member of a number of private and public companies and professional organizations. Mr. Bell is a director of Current Technology Corporation which markets an electrostatic hair maintenance and re-growth process, since 1992. Since 1997 Mr. Bell has been a director and is the President of Ezon Healthcare Corporation, a private company that is involved in the development of a graphic labeling system for pharmaceutical products. Mr. Bell has provided a wide range of consultant services to businesses and health care companies and organizations. These consultant services included: sales management and reorganization of sales force; regional market development and marketing strategy; medical opinion surveys and market analysis; medical device product market development; business immigration program presentations; management studies in healthcare organizations; development and growth of public corporations and reverse takeovers in public companies. Mr. Bell holds a Bachelor of Science Degree in Pharmacy from the University of Manitoba and a Masters in Business Administration from the University of Western Ontario. Mr. Bell has been appointed to the Company's audit committee, the nominating and corporate governance committee, and the compensation committee. Mr. Richard W. Holmes was an assistant controller with Duke Power Company (now Duke Energy) from 1971 to 1981. Duke Energy has operated nuclear plants for more than thirty years. While at Duke Power Mr. Holmes was Assistant Controller of the parent company. He was also Treasurer of Eastover Land Company, a $100 million subsidiary of Duke's with interests in coal properties in Kentucky and West Virginia. Concurrently, Mr. Holmes was Treasurer of Western Fuel, Duke's uranium mining project in Wyoming. Mr. Holmes left Duke in 1981 to become Treasurer and Controller of Ogle Resources Inc., an oil and gas company with offshore exploration, drilling and production from 1981 to 1986. At the same time, Mr. Holmes was Treasurer and Controller for a sister company with an investment in in-situ recovery uranium mining in Wyoming. Mr. Holmes received his bachelor's degree in accounting from the University of Wisconsin. He held the position of Senior Auditor at Arthur Andersen & Co. in Chicago, Illinois, from 1968 to 1971. Mr. Holmes was an active certified public accountant from 1971 to 2003. Mr. Holmes has been appointed to the Company's audit committee, and the nominating and corporate governance committee. Shareholders and potential shareholders may be interested in Uranerz Energy's Investor Package, Newsletter or Events Calendar. URZ IR enquiries should be directed to Mr. Derek Iwanaka - see Contact Information at the end of this report, or simply complete this My IR Info Contact Form. Additional company and stock related information is also available at www.Uranerz.com. Global demand for uranium rose steadily from the end of World War II, largely driven by nuclear weapons procurement programs. This trend lasted until the early 1980s, when changing geopolitical circumstances as well as environmental, safety, and economic concerns over nuclear power plants reduced demand. The production of a series of large hydro-electric power stations also depressed the global market. During this time, large uranium inventories accumulated. In fact, until 1985 the Western uranium industry was producing material much faster than nuclear power plants and military programs were consuming it. Uranium prices of over US$40 per pound U308 in the 1970's slid throughout the balance of the century with few respites. By 1981 the uranium import price had fallen to US$32.90, then all the way down to US$12.55 in 1990 as the Cold War ended, to below US$10 per pound for yellowcake by the year 2000. Uranium prices reached an all-time low of US$7 per pound in 2001. As uranium prices fell, producers began curtailing operations or exiting the business entirely, leaving only a few actively involved in uranium mining and causing uranium inventories to shrink significantly. Since 1990 uranium requirements have outstripped uranium production. World uranium demand is expected to increase steadily throughout the next decade to a peak of over 200 million pounds of yellowcake. Several factors are pushing both industrialized and developing nations towards alternative energy sources. The increasing rate of consumption of fossil fuel is a concern for nations lacking in reserves, especially non-OPEC nations. The other issue is the level of pollution produced by coal-burning plants, and despite their vastness, an absence of economical methods for tapping into solar, wind-driven, or tidal reserves. Uranium suppliers hope that this will mean an increase in market share and an increase in volume and prices over the long term. For any commodity, growing demand or lowering supply, especially at the same time, usually spells much higher prices. Uranium prices are also affected by the price trends of energy substitutes, such as oil. From the lows of US$7 per pound in 2001, uranium prices gradually recovered and then accelerated higher starting in 2004. During 2007 and 2008 both oil prices and uranium prices soared to new all-time highs. Higher uranium prices spurred expansion of current mines, construction of new mines and reopening of old mines as well as new prospecting. Then energy prices in general crashed as the global economy fell into the worst recession since WWII. Oil prices that had far surpassed its 1980 previous peak of $US80 a barrel, fell from its new all-time high price of US$147 a barrel in July 2008 all the way down to US$32 a barrel by December that year, eventually stabilizing in a $60-$80 trading range by October 2009. Uranium prices that made all-time highs of US$137 a pound in 2007, fell to around US$40 a pound and has also stabilized higher. Recently oil and uranium have been trending higher again, with oil now around US$90 a barrel and uranium back up to US$70 a pound. For producers, and expected near-term producers like Uranerz Energy, implied higher resource values may support higher value stock market capitalization as more analysts and investors recognize the price trend of the underlying commodity, and how this potentially may lever future earnings. All commodities prices are volatile, changing with geopolitical whims in addition to the standard forces of supply and demand. This is especially true for uranium, with its unique features and only one significant commercial use - the fuel for electrical generating nuclear reactors. The Monthly Uranium Spot chart above shows how uranium prices can spike violently, as they did from 2005 to 2008 at the same time world oil prices soared. As of January 2006 there were 440 reactors operating worldwide, with 69 new reactors planned or under construction and to be completed within the next 10 years. These numbers are probably higher today. Uranium is mined underground or in open pits, then milled into a dry powder called yellowcake, enriched and fuel fabricated into fuel assemblies or bundles, and sold on the uranium market as U308. Technology processes are challenging and complicated. Mining methods employed are: 61% conventional underground and open cast, 29% in-situ leaching and 10% by-product. Approximately 100 uranium mines are in different stages of development in 25 countries. Canada, Australia and Kazakhstan account for 63% of world uranium production. Other important producers of 1000 tonnes or more per year include: Namibia, Russia, Niger, Uzbekistan and the United States. The largest uranium mines are: Canada's McArthur River, Australia's Ranger and Olympic Dam, Russia's Krasnokamensk, and Namibia's Rossing. For many years Canada was the largest exporter of uranium ore, however in 2009 Kazakhstan became the largest uranium producing country with 27% of the 50,572 tonnes produced worldwide. Cameco's large and very high-grade Cigar Lake mine in Saskatchewan is expected to start production in 2013, and this lead may again return to Canada. Uranerz Energy specializes in uranium ISR - the In-Situ Recovery mining process. ISR mining comprised 36% of global uranium production in 2009 according to the World Nuclear Association. Nearly all uranium mining in the United States and Central Asia employs this method. Uranerz plans to use the low cost mining process of in-situ recovery mining, a process that uses a 'leaching' solution to extract uranium from underground ore bodies. The 'leaching' agent, which contains an oxidant such as oxygen with sodium bicarbonate (commonly known as baking soda), is added to the native groundwater and injected through wells into the ore body in a confined aquifer to dissolve the uranium. This solution is then pumped via other wells to the surface for processing -- resulting in a cost-efficient and environmentally friendly mining process. Wyoming is the largest uranium producer in the United States with a long ISR history and has the largest known uranium resource base in the U.S.. Uranerz Energy's management team has specialized expertise in the in-situ recovery mining method with a record of licensing commercial ISR projects; including direct experience in licensing, designing, constructing or operating seven separate in-situ recovery uranium mines located in Wyoming, Texas, Nebraska, and Kazakhstan. Strength in commodities prices typically lead economies out of recession. So far this appears again to be true as commodities prices for mining, agricultural and energy, and for share prices of their producers, have mostly recovered since the recession fallout of 2008 and 2009. For example, gold, silver and copper have not just recovered, their prices are actually near 30-year or all-time highs. Energy also seems to be trending higher again, however uranium prices now at US$70 a pound are only about half way to their 2007 highs of US$137 a pound U308 yellowcake. Since spring 2010 we have been saying in some of our Guru Trader Tweets & Videos that uranium prices and uranium stocks of substance are way overdue to run again soon, in a catch-up mode to the returns of other commodities. This may be similar to what happened last year with gold and silver prices, and especially their relative returns. In our December 1, 2009 report entitled "Is Silver Set to Rocket Higher - much more than gold prices, in percentage terms?" we wrote about how higher gold may translate into even higher returns for silver if the gold/silver ratio tightens closer to historic norms, as we expected. The gold/silver ratio was then 64 and has since tightened to now 47, which we still feel will eventually test the 1980 low of around 15. The 2010 London USD gold fix shows $1121.50 on January 4, and $1405.50 on December 30, a return of 25.32% last year. 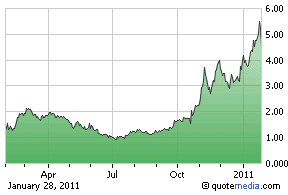 The 2010 London USD silver fix shows $17.17 on January 4, and $30.63 on December 31, a return of 78.39% last year. Our hypothesis was correct, as both gold and silver went up last year, and the gold/silver ratio tightened significantly by 17, resulting in the return on silver being over three times as much as for gold in 2010. To clarify we still like gold, silver and other precious metals, various base metals and energy. However even within long-term secular bull-markets there are spits and starts when one commodity within a related group outperforms the others. This is what we identified when targeting silver over gold, and now uranium over oil. We still like oil, but for that extra near-term boost perhaps uranium is better positioned right now. Uranium futures don't provide the liquidity of most other commodities, and you can't hold it like gold. We were looking for a pure-play uranium company with an established resource already in development, and with potential further upside from active grass-roots exploration and drilling. Our focus is always on small-cap, with a market value under $500 million, because share prices tend to be impacted more by positive news than for large-cap companies. We also consider management experience, funding and political risks etc. The first three things we look for in small-cap mining stocks are our three P's - Positioning, Properties and People. Why uranium vs. other resources was just explained and Uranerz Energy qualifies as it is a pure-play uranium company. This means uranium exploration and development is all Uranerz does - no other base metals, precious metals, gem-stones, oil or other resources, like some of their competitors. Uranerz Energy has approximately 71 million common shares issued and outstanding, which seems relatively tight for a small-cap with such advanced mining projects. The company's shares also seem relatively liquid, and trade on multiple stock exchanges and currencies. Uranerz trades most actively on the NYSE Amex ticker symbol URZ, averaging between two and three million shares per day. Uranerz also trades on the Toronto Stock Exchange under TSX symbol URZ, and on the Frankfurt Stock Exchange under symbol U9E. More on the company's stock listings, averages and distribution can be found in the tables at the start of this report, or click the green tabs at our Uranerz Energy Stock Research Portal. Uranerz Energy appears to be in sweet spot right now. On December 29, 2010 they announced completing a $20 million financing. The company now has approximately $36 million in its treasury and no debt. Uranerz also announced on January 26, 2011 an accelerated expiry date to the holders of 4,225,000 share purchase warrants, which will cash-up the company by approximately US$12.7 million more if all of the warrants are exercised. On January 4, 2011 Uranerz Energy announced state approval of one the first new commercial uranium permits issued by the Wyoming Department of Environmental Quality WDEQ in almost 20 years. The company then announced on January 24, 2011 that the United States Nuclear Regulatory Commission NRC has completed the final Supplemental Environmental Impact Statement SEIS, the final permitting green-light to commence mine construction towards uranium production at their Nichols Ranch project - see above Uranerz Energy Recent Headlines - news releases and announcements. Keep in mind this is only the first of Uranerz Energy's 30 uranium projects in the Powder River Basin area of Wyoming, U.S.A - see above Uranerz Attributable NI 43-101 Resources Table for seven of its uranium projects as of October 14, 2010. Also see our Producers vs. Uranerz Energy's Stock table above, which shows URZ's market-cap now at US$314 million, not yet a uranium producer, and also shows six uranium producers with market-caps ranging from $3.5-billion to $243.7 billion. URZ is up around US$5 a share again, and it is obvious the company's projects are much further ahead than they were in 2007 when URZ then traded as high as US$7.50. Is the market valuing URZ as just an exploration company, a development phase company, or with some future producer premium built-in? The company's website lists financial analysts already covering URZ who are better qualified to answer these types of questions. On January 25, 2011 Dundee Securities Corp. mining research analyst David Talbot updated their URZ Research Report: "Conclusion: We are increasing our 12-month share price target to C$5.60 from C$4.25 as risk decreases significantly with the receipt of its Final SEIS. We now expect its final NRC license within 30-40 days. We continue to recommend the stock at BUY and expect the stock to perform well over the next month towards the expected issuance of its final NRC permits. ..."
Also on January 25, 2011 Haywood Securities Inc. research analyst Geordie Mark Ph.D., FSEG, updated their URZ Research Report: "... Target Price, Ratings - We are increasing our target to $6.10 from $5.20, with the transition from a 1.0 x NAV valuation to a 50:50 blend of 10.0 x our 2013 CFPS estimate and 1.0 x our corporate NAV. In our view, the project has been significantly de-risked, and given the strength of the technical team we integrate a forward cash flow in our valuation on expectation of production commencement in Q2'12. We retain our SECTOR OUTPERFORM Rating & SPECULATIVE Risk profile. ..."
Small-cap followers prefer active companies with regular positive news releases. Uranerz Energy is now moving to the mine construction phase on their Nichols Ranch project, with permitting already underway on another project, and with drilling plans expected for several projects. All of the company's uranium properties are within the Powder River Basin Wyoming area of the United States, which means Uranerz shouldn't have the political risks, infrastructure, security, bribes, transportation and repatriation issues etc. that miners regularly have to deal with when developing projects in far-away lands. We expect 2011 to again be an active year with lots of permitting, financing, drilling and resource updates. One of the most impressive features about Uranerz Energy is their management team - see bios for Uranerz Energy's Key Personnel. The background statement says it all: In July 2005 management changed its corporate name to "Uranerz Energy Corporation". Uranerz is an identity that most of the current management had worked with before, as former officers, senior management and employees of the original Uranerz Exploration and Mining Limited and related companies (the "Uranerz Group"). The Uranerz Group was the world's third largest uranium producer when it was acquired in 1998 by Cameco, the world's largest primary uranium producer. This management team has the experience, the contacts, the ability, the competency and the desire to build Uranerz into a significant producer of uranium. The Company also has an advisory board that consists entirely of ex- Uranerz Group professionals. Uranerz Energy Corporation's achievements and plans are starting to get noticed. On January 26, 2011 Brett Harris interviewed URZ's CEO Glenn Catchpole on BNN's "The Street" TV program, during the Roundup Mining Conference in Vancouver, British Columbia. Watch the interview at http://watch.bnn.ca/#clip407515 . Investors Guru added Uranerz Energy Corporation (Amex/TSX: URZ) to its Top 30 Small- Cap Stocks watch-list at US$3.20 on December 22, 2010, up $1.24 or 39% as of Friday's January 28, 2011 closing price of US$4.44. It's Free to sign-up at InvestorsGuru.com for our monthly newsletter and Uranerz Energy Corp. updates, or to join our stock forums or set-up your own My Portfolio, My Watchlist & Alerts or News by Email preferences. Uranerz Energy Corporation is a Featured Stock at InvestorsGuru.com and pays a monthly corporate services fee over one year for internet advertising and distribution of company updates. This includes display ads, bulletin boards, reports and news by email, plus other types of company awareness via Investors Guru global media network of small-cap stock websites, social sites, mobile sites, video channels and syndicated news blogs. Information contained in this report was compiled from, or based on, various sources believed to be correct, however should not be relied upon without verifying with the company and your advisors. Sources include our website's financial data quote feeds, the company's website and news releases, plus various news, encyclopaedia or other online sources in the public domain. Request Uranerz Energy's Investor Package, Newsletter etc. I've heard of a entrepreneur: Paul Deuchar from the robotics sector in WA, he's been working in tech sector and my client wants to put US$1m on the table to try him, any thing I should be aware of with him?